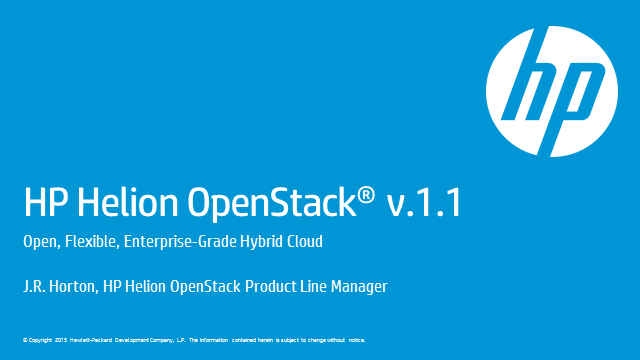 Learn the new features and updates introduced in HP Helion OpenStack version 1.1 to enhance ease of use. Highlights include additional enhancements in storage integration with 3PAR and Ceph, new lifecycle management capabilities including targeted node provisioning, new deployment options at both the hardware and OS levels, and enhanced security features including expanded centralized logging and optional integration capabilities with HP ArcSight. In this webinar, attendees will learn how to transform HP Helion Content Depot object storage into enterprise-grade, highly secure file services with the CTERA Enterprise File Services Platform. The CTERA platform is designed to enable the IT-as-a-Service transformation, delivering data protection, enterprise file sync and share, and remote office/branch office (ROBO) storage services that can be deployed on your choice of cloud infrastructure as a fully-private, behind-the-firewall system. Join us and learn how to deploy the CTERA solution in conjunction with HP Helion. We'll present the solution and demonstrate how the CTERA platform is connected to the HP Helion object storage, and its main key component and features – ranging from the management interface to the end user view and functionality. The accelerating pace of change driven by cloud, mobile and big data requires application delivery pipelines to be faster and more agile than ever. IT teams that rely on traditional methods alone find that they’re unable to keep pace with demand, resulting in growing backlogs and missed opportunities. Join this webinar to see how HP Helion Development Platform is enhanced with visual, model-driven app development by Mendix for HP Helion. Learn best practices for cloud-native rapid app development and how Mendix enables agile app development for 6-10 times faster results than traditional methods. We’ll take you through the complete application lifecycle—from visual design and development to one-click deployment and auto-scaling—and show you how to get started with these powerful capabilities. Couldn't make the 9am webinar? We are offering a second chance to learn directly from our technical experts. Security continues to be the #1 barrier to enterprise cloud adoption. Enterprises are concerned with compliance, as high profile security breaches are almost a weekly occurrence. Learn in this webinar how to integrate HP ArcSight logging with HP Helion OpenStack using the centralized logging feature to manage and monitor your private cloud environment for continuous compliance against security threats and breaches. Security continues to be the #1 barrier to enterprise cloud adoption. Enterprises are concerned with compliance, as high profile security breaches are almost a weekly occurrence. Learn in this webinar how to integrate HP ArcSight logging with HP Helion OpenStack using the centralized logging feature to manage and monitor your private cloud environment for continuous compliance against security threats and breaches. As part of the 1.2 version of the HP Helion Development Platform, HP is adding complete end-to-end Windows® support by providing the ability to host Windows applications on a Windows DEA (Droplet Execution Agent). .NET developers can now develop, deploy and manage cloud native .NET applications in their HP-offered, Cloud Foundry based PaaS, which is a core part of the HP Helion Development Platform. Attend this live webinar to learn more about this recent announcement, plans for community contributions, and live demonstration of product capability for .NET developers. This is an interactive session and we will be taking live questions from the audience. For CSPs, the implementation of a vCPE strategy for delivering broadband and enterprise communication services represents one of the largest business opportunities to positively impact top-line revenue, reduce opex, and retain customers. IDC forecasts that the global managed network services (MNS) segment will grow from $72 billion in 2013 to $102 billion by 2017, a CAGR of 10%. IDC predicts that implementing vCPE solutions will enable CSPs to transform and improve the cost structure, speed of delivery, and flexibility to offer and support new and existing enterprise services compared with the current business CPE delivery models. Two of the largest vCPE applications today are managed MPLS/IP VPN enterprise services and firewall services, which together account for over$45 billion of global managed services revenue. Join Julia Ochinero, HP NFV senior director of marketing, Richard Arthur, HP NFV solution manager and Nav Chander, principal analyst, IDC for discussion on vCPE and the business opportunity that vCPE presents. Learn how the HP StoreVirtual VSA solution enables OpenStack workload deployment within HP Helion OpenStack in a faster, cost-effective, scalable and flexible way. The HP Helion Development Platform, which sits on top of the HP Helion OpenStack® infrastructure and is built on the CloudFoundry™ open source technology, is a service that enables developers to rapidly develop, deploy and scale applications across a mix of public and private clouds. Join us in learning more about the features and benefits of the HP Helion Development Platform – and learn about what’s new for developers & IT administrators in the newly launched version 1.1. HP Helion Eucalyptus is the most recent addition to the HP Helion product family. It is designed for customers needing to migrate existing AWS workloads and applications to a private cloud to control costs, improve data governance and application performance. AWS compatibility is considered a key requirement. In this Coffee Talk we will discuss HP Helion Eucalyptus features, customer examples and how it is positioned relative to HP Helion OpenStack®. Cloud object storage is rapidly becoming a favored technology of choice for many organizations. OpenStack® Swift is the storage project which support object storage platforms. This presentation will provide fundamental information on OpenStack Swift – what it is, what it is used for, and what are some of the key technical aspects. This presentation is targeted for intermediate level technical viewers who want a solid understanding of OpenStack Swift. Your ability to quickly provision application development resources not only enables business agility, it reduces the friction between Ops and Apps teams. Platform as a service (PaaS) has emerged as one of the most effective ways to do this. In this “Getting Cloud Right” episode, we’ll clarify exactly what PaaS is (and isn’t), why and when you should consider using it, as well as its benefits and risks. Our guests and PaaS experts, Josh Barry, senior product manager, HP Helion, and Arun Jacob, director of product management, HP Helion, will share real-world insight on the current state of PaaS, its optimal use cases, and descriptions of real-world implementations. Barry and Jacob will also offer advice and resources to explore to learn more about PaaS. In this "Getting Cloud Right" episode we'll explore three critical best practices that can help ensure the long-term success of your infrastructure-as-a-service (IaaS) efforts. Like many in enterprise IT, you may be looking at IaaS as a way to extend your data center virtualization success and get one step closer to a cloud-based IT delivery model. But long-term success with IaaS requires much more than simply provisioning virtual machines. Through real-world insight and advice, our cloud and IaaS expert, Muneer Mubashir, Group Marketing Manager for Cloud and Automation, HP Software, will explain what this means. Additionally, Mubashir will share 3 critical IaaS best practices: Process—why it still matters; how compliance needs to be part of every policy; the importance of taking a phased approach and focusing on quick wins. Introducing HP IDOL OnDemand, an essential part of HP’s recently announced HP Haven OnDemand platform, a cloud based Big Data solution providing a fast-track to data-driven insights. With 50+ REST APIs for cloud-, mobile-, and IOT-apps, connect your data with web & file system connectors; extract meaning from unstructured data e.g. Concepts, context, sentiment, entities (incl. people, places, addresses, companies, drugs, films, profanities, PII…); and index any data from multiple sources! Use the powerful search APIs with contextual and conceptual search across public and private datasets, and combine APIs to discover and unlock valuable insights from your data like never before! In this live webinar we will show you how easy it is to use IDOL OnDemand’s many APIs to extract, index, search and analyze all types of human information, such as Emails, Tweets, Documents, or even Recordings. Join Phani Raj, Senior Software Engineer at HP Cloud as we dive into to integrating OpenStack APIs into node.js applications. Pkgcloud is a multi-provider provisioning library for node.js, with significant support for OpenStack services. In this presentation we'll explore the calling convention that is generalized across providers, as well as look at practical examples of how you can integrate pkgcloud into your applications to leverage OpenStack. Additionally, we'll explain how to contribute and extend support for custom OpenStack deployments. HP Helion portfolio of cloud products and services provides enterprises and service providers Open Source based alternatives to existing proprietary solutions for private and hybrid cloud deployments. The session will focus on the technical architecture and services available in HP Helion OpenStack and HP Helion Development Platform and describes how HP’s strategy to bring together OpenStack and CloudFoundry ALS helps enterprises deploy and manage complex cloud workloads in an integrated approach. Cloud is an essential component of every enterprise tech management strategy, but sifting through market noise to design a robust cloud strategy isn't easy. Despite reported high private cloud adoption, Forrester continues to see enterprises struggle with their private cloud build-out. Success with a private cloud comes only through embracing the true cloud model of self-service, full automation, and business and developer agility. But most technology managers lack enough hands-on experience with public clouds to truly understand the end user experience priorities and how to translate them to their own environments. Their focus is less on developer enablement and cloud-specific values and more on optimizing IT efficiency against tech management metrics. The result is developer rejection. This report outlines the top 10 facts every tech management pro should know about private clouds to avoid over-investment, missed deadlines, and strategies that limit better engagement with your internal customers. Plus, attendees will receive the Forrester white paper, Top 10 Facts Every Tech Management Leader Should Know About Private Cloud. This video explores the critical people and organizational considerations you must take into account when moving to a cloud-based, IT-as-a-service operating model. Join Chris Cannon, Sr. Technical Evangelist – HP Helion for a webinar on Installing HP Helion OpenStack Community Edition in a Virtual Cloud Environment. Let us help you get started with HP Helion OpenStack! 1. Chris will provide tips and describe the steps to install HP Helion OpenStack Community Edition on a single machine using the Virtual Cloud installation method. 2. By attending the webinar you will learn the requirements and preparation of the host, how to obtain the software and complete a successful installation of the product on a test machine. 3. This webinar will help you setup a test machine that could be used as the basis for exploring, testing, and learning about the product prior to deployment in a production environment. Now cloud lives up to it's promise..